Kills 99.9% of bacteria & viruses. 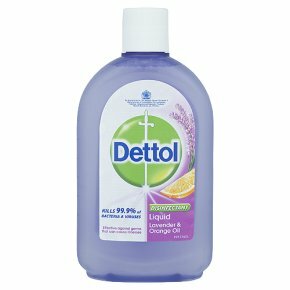 Effective against germs that can cause illnesses.Dettol Disinfectant provides expert protection against harmful bacteria and can be used on many surfaces in your home or as an anti-bacterial skin cleanser. Dettol's unique non-bleach formula is proven to kill 99.9% of bacteria on surfaces, including E.coli, Salmonella, Listeria, MRSA, and the flu virus. Where to Use: Drains. Toilet seats and handles. Toilet bowls and brushes. Bins. Floors. Work Surfaces. Sinks / Taps. Dish Cloths. Non porous chopping boards. Non porous high chairs. Potties. Changing mats. Laundry. Hard surface pet areas. Skin cleansing. How to Use: Neat/Undiluted: Use undiluted on bins, drains, plug holes, toilet bowls, and to wipe toilet seats/handles. Diluted: General surface disinfection including food contact surfaces: 83 ml to 1 litre of water for hard surfaces and dish cloths (soak overnight). For hard surfaces (food contact and pet areas) always read the precautions below before use. General laundry disinfection: add 160 ml to the rinse cycle of your wash. Anti-bacterial skin cleansing: 83 ml to 1 litre of warm water. Apply onto the desired area for 5 minutes and rinse with plenty of water. Always read the precautions below before use. Use biocides safely. Always read the label and product information before use. Precautions:<br>Always test on an inconspicuous area before use.<br>Skin cleansing: Do not use neat/undiluted. Do not use on broken skin. Do not use on children under 3 years. Not suitable for intimate hygiene. Not suitable for bathing.<br>Hard surface pet areas: Never use directly on pets. Always rinse and allow surface to dry before reintroducing pet.<br>Food contact surfaces such as non porous chopping boards, non porous high chairs, and sinks: Rinse with water after use on surfaces in contact with food and allow surface to dry.<br><br>Caution: Irritating to the skin when used undiluted. After contact with skin, wash immediately with plenty of water. Risk of serious damage to eyes. Avoid contact with eyes. Wear eye/face protection. In case of contact with eyes rinse immediately with plenty of water and seek medical advice. If swallowed, seek medical advice immediately and show this container or label.<br><br>Irritant.<br><br>Keep out of the reach of children.